Rainbow Swarovski crystal Chakra necklace, sterling silver, sterling clasp, custom made to order. Announcement Welcome to Energy Beads.net! I am glad you checked in. Art and music are my life! I specialize in creating jewelry items from natural semi-precious gemstones including high grade larimar from the Dominican Republic. Custom orders are my favorite. The metals I use most often are sterling silver, gold-filled, and copper. I encourage you to contact me if you are interested in LARIMAR items. I have lots of fine quality beads and can create custom earrings, necklaces,and bracelets to fit. I offer my excess jewelry supplies, findings and beads for sale. You'll find energy-focused original and vintage art and jewelry for intentional living, hand-crafted unique chakra jewelry, earth elements jewelry, necklaces, bracelets and earrings made from semi-precious gemstones, crystals, and natural materials, original mandala art and vintage animal art limited edition lithograph prints by Charles Frace are also listed. I am a songwriter and musician and part of a women's group, Lizzie and the Yeehaw Gang, playing Americana, bluegrass and folk music. I play drums, upright bass, mandolin & guitar (a little), percussion and drive the band bus. I write my own songs and collaborate on songs with the band leader, Lizzie Yee. May the items offered here help create more beauty, balance and delight in your life and the world. Please let me know when this occurs, I would love to share in your joy and I appreciate feedback. Feel free to convo me for additional information. Welcome to Energy Beads.net! I am glad you checked in. Art and music are my life! 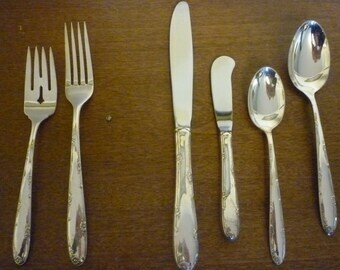 Towle Madiera, Sterling Silver Flatware, vintage, 8 piece service + butter knives, soup spoons, anti-tarnish box. SALE! Beautiful pendant, wonderful quality and attention to detail. Sally was amazing with a change I asked for, going above & beyond with choices for me. I am thrilled with my pendant! Very pleased with the quality and appearance of this stone and necklace.